Bold, satisfying, full-flavored tobacco taste. Specially blended to simulate the taste of the popular world-wide selling red-box cowboy brand. 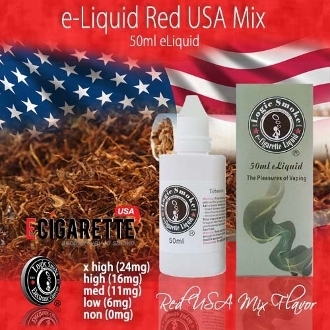 Logic Smoke eLiquid USA Red Mix flavor will give you the fulfilment of the taste of your favorite tobacco cigarette, delivered through the convenience and ultimate satisfaction of red usa eliquid flavor in your favorite e-cigarette. With the perfect blend of an 80/20 PG/VG mix (propylene glycol and vegetable glycerin (organic, food grade preservative compounds), you'll get the best flavor concentration along with the perfect amount of vapor to satisfy your vaping needs.